Want to maintain your own site but not familiar with complex web editing software like Dreamweaver? Maybe you would like to update your site on a regular basis without the help of your web guy. This can be done easily with Adobe Contribute. Maintaining your website with Adobe Contribute requires the credentials for initial setup. 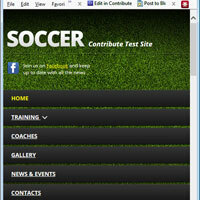 Once Contribute is setup, you just browse to the page you want to edit, hit the edit button, make you changes & publish. There’s a lot more you can do once you are familiar with the software but just making content on your site may be all you want to work with at 1st. Demo test site - email me for credentials. Download the Contribute trial from Adobe. You will need a free Adobe account. Run Contribute trial at least once/session to enable changes. Once you have Adobe Contribute installed email me for the credentials to the demo site. Download Contribute. You can get a demo of Contribute from Adobe. They will require an Adobe account but that’s free and easy to create. Basically you just need to download the software and install. Run the software as a trial and you can give it a test drive. Editing website with Contribute requires credentials for initial setup. Click the Edit button (Contribute or Internet Explorer) and then double click in the area you want to make changes. Here is our demo site to get you familiar with publishing with Contribute. Once your changes are in place you need to publish to make them live. If you don't have administrator privileges then you can't make your changes live. You can still edit the pages but need an administrator to approve and publish for you.